Or, it could be "bagged". Like the Lakewood in the San Jose area. Could be. But ,more likely one of those brief incidents of Compounded Gravity that occasionally occurs here in Kalyphornya and is reported to be caused by human intervention upon the natural carbon content in the atmosphere and compounded by excessive oil drilling, heavier SUV's, raising castle and unregulated - imported banana's from places below the equator. A four million dollar grant - study recently exposed this phenomenon! My money on bagged...seen to many sitting on the gound in front of me at car shows lower than that...the last ime I looked....no photoshop in my brain....no room for it....processor full. On the other hand...early models usually have a bad case of camber if lowered...huuumm....hard to tell from that angle. Why is everyone talking about the car being lowered? I thought the question was about whether the 4-door roofline on 2-door was faked. the low is not really a big deal. To me it is the coupe with the sedan roof thing that is going on that is impressive. Top one is surely Shopped... but Tkalp's pic show's there's a real on out there! Edited 1 time(s). Last edit at 12/15/2017 03:25PM by MattNall. 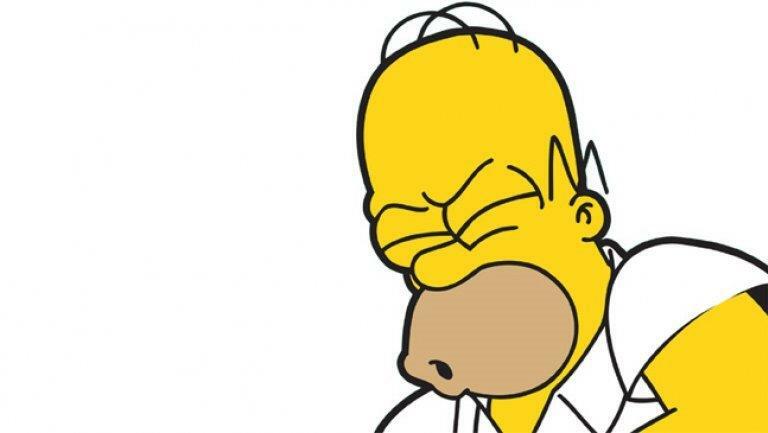 > show's there's a real on out there! Maybe, . . . . . .
it is the same one? 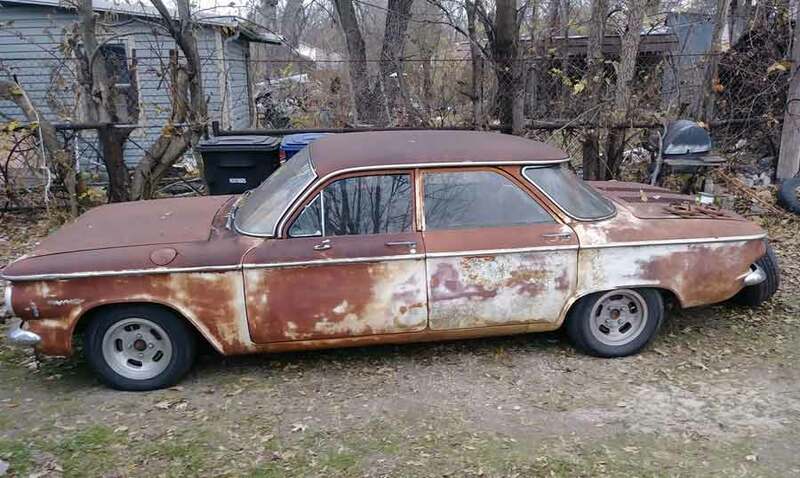 Did someone restore it possibly? If that top one is P-shopped, they did a fantastic job! All of the tiny details just look right. Either way, it looks good! Edited 2 time(s). Last edit at 12/15/2017 03:25PM by MattNall. I like it! I almost like it more than the actual early coupes. The photo I posted is Photoshopped. 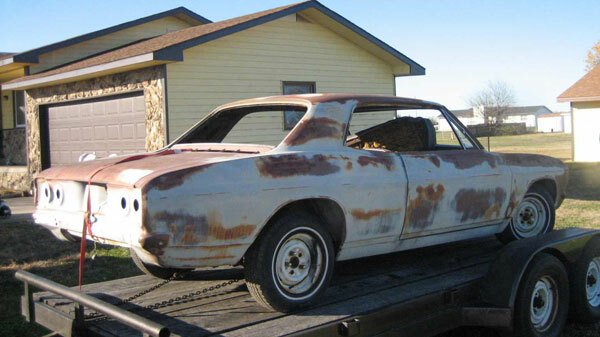 Father and son Dennis and Sam Fuller picked up a pair of patina EMs at the recent auction of 40+ Corvairs in Oklahoma. Photos below. At least the paint matched on both of them. Now that you mention it, I see the duplicated trees in the window reflection. I love that phantom coupe, wish that the factory had gone that direction, I just might still own an early. Matt said, "Top one is surely Shopped... but Tkalp's pic show's there's a real on out there!" Uh Matt, did you possibly mean that the other way around? I was fooled.... the only question I had was the darkened window..
Matt knows my history for 4 dr 2 dr hybrids. Recently sold the two-door wagon project (real) and am finishing up the LM 4 dr roof on a 2 dr body (real). There may be a real EM 2 dr 4 dr project in my future. Call the 2-dr wagon the "Monad"
tkalp, you really like white vehicles, eh? It appears you did the shorter roof? American Mel, only the two-door with the four-door roof is mine in that photo. 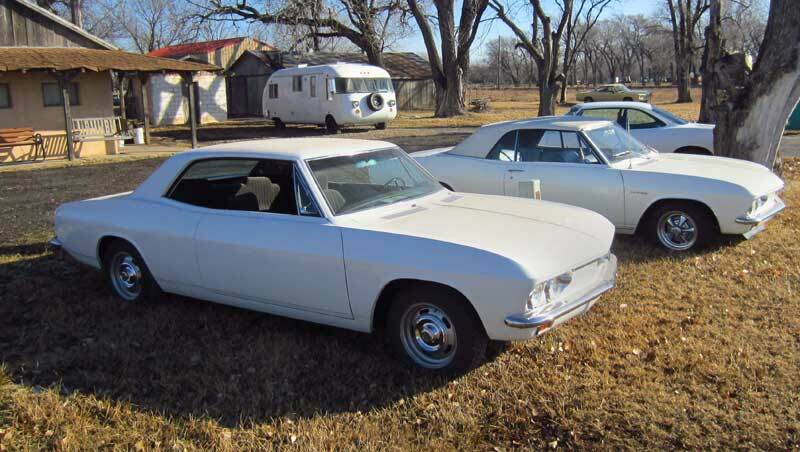 However I do have a white '65 Monza convertible and a white '65 Corsa convertible plus a white '60 four-door. The roof on the wagon is stock length, I used the two-door door which is 9" longer than the wagon front door. 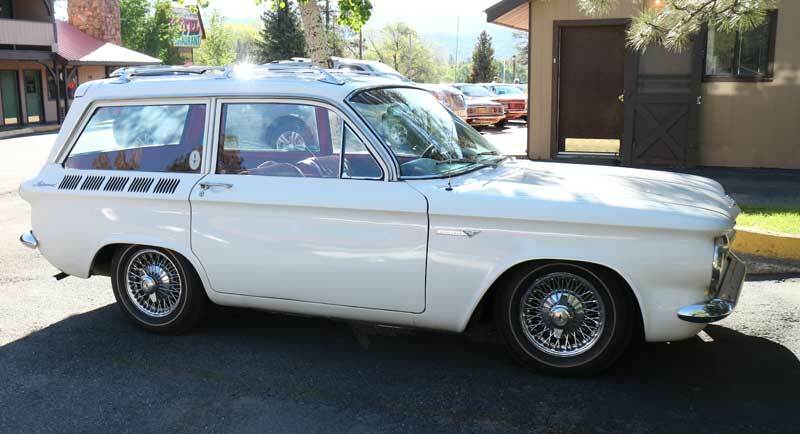 There is a shortened two-door Wagon in Colorado, it just happens to be white also. 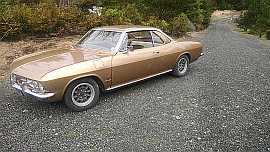 Many years ago, there was a discussion about a Durham 4 door EM Corvair. Does anyone know what happened to that car, or have any pictures of it? 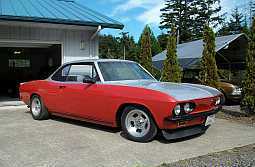 Has anyone ever made an early 6 door Corvair. 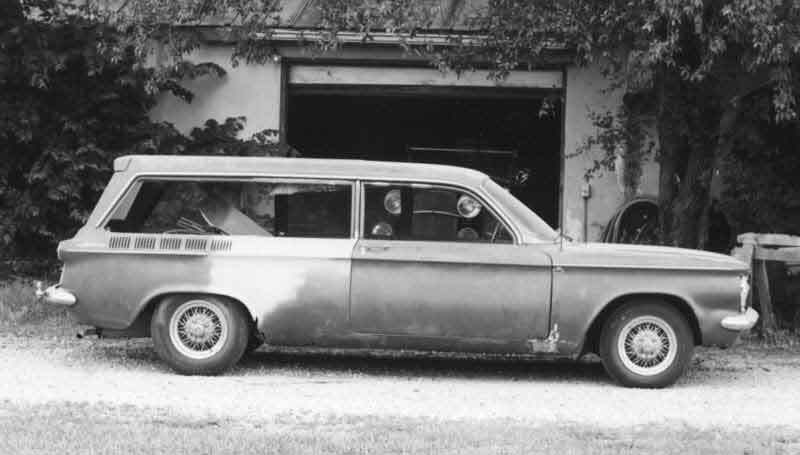 I remember a bunch of the Plymouth Horizons being made into 6 door cars for larger families. The would cut and graft in an additional door, roof, and floor section. The person doing them made them look like they came out of the factory that way. I was talking about height, not length. 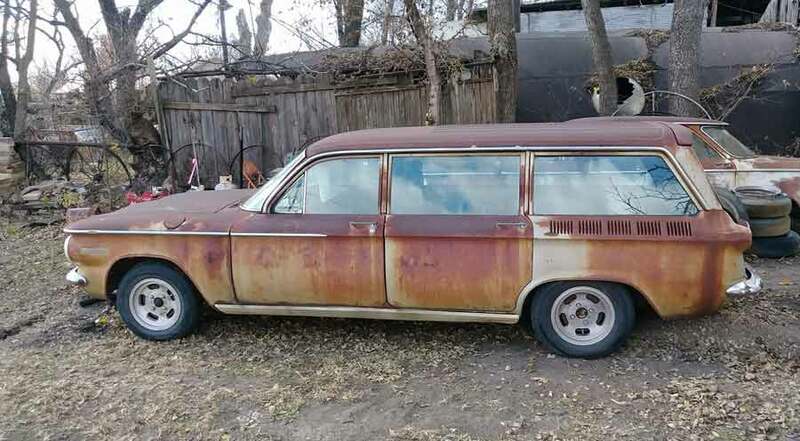 But it is just the front window that is taller on wagons not the roof, isn't it? That wagon needs to be called, . . .
Oh, and add some little vertical chrome strips on the tail-gate.